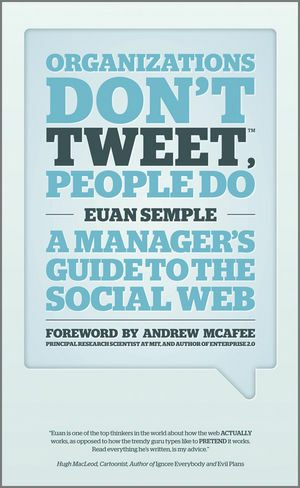 Interesting reading this article on the low take up by staff of social platforms in business. It's the usual IT story of overselling and under-delivering. There is now an industry around ESNs (Enterprise Social Networks - even use of the name is a problem) and people are investing silly money in technology while being pretty clueless about why they are doing it. In an attempt to identify success factors the article refers to the success of GE's Colab and says "from the start encouraged employees to use Colab, telling them it would be a tool where they would find valuable content and interactions that would help them with their work." as if this was revelatory! Of course this is why you want these tools - and of course this is how you encourage people to get involved. But you have to really want that result and all that it entails. Too often I see managers of various persuasions (marketing, comms, even IT) being coerced into leading major social projects that are approached like every other large scale IT project (of which historically something like 72% fail!) They do this with vague ideas of improving communication or collaboration but get sucked into worrying about the tools. Instead they should be focussing on helping staff make the significant cultural leap from process focussed caution to the open and mature dialogue that you really want if they are going to address and sort their real problems. To bring about this shift someone has to care, they have to care a lot. They have to share their passion and give others a reason to invest their time and energy in a whole new way of working. This isn't about tinkering with existing processes and systems, it is a fundamentally different way of getting things done that, if you get it right, will lead to wide-scale upheaval in your business. You have to really want this. You have to really care.